Some machines need time to process the received data. 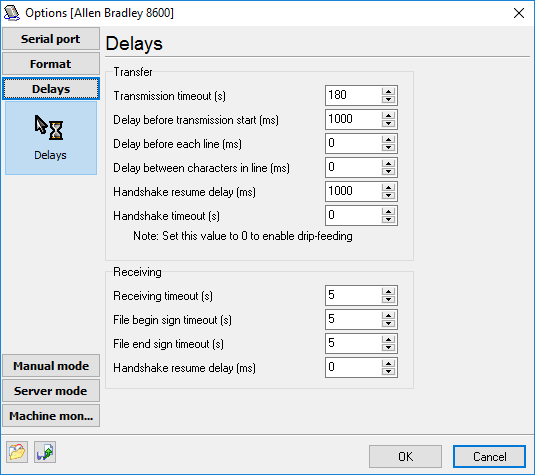 To save the time for analyzing handshaking signals, you can specify preset delays that will ensure high quality data transmission. Transmission timeout (s) - Use this field to specify the time interval for the DNC to return to the normal working mode. Delay before transmission start (ms) - Use this field to specify the time for the DNC server to wait before sending data. This time interval will be observed either when a request is received from the NC in the server mode or between files in a cyclic mode of transmitting files. Delay before each line (ms) - Use this field to specify the time interval to be observed before sending each program line. Delay between characters in line (ms) - Use this field to specify the time interval to be observed between sending each character in a line. Handshake resume delay (ms) - Use this field to specify the time interval to be observed between changes of RTS signal from up to down state. Handshake timeout (s) (Drip feed mode) - our software supports drip feeding the large program to the machine control. In this mode the DNCP sends a portion of data while the machine is receiving it. When the machine can't receive more (a machine memory is full) then the machine sends a signal to a PC (with help of the hardware flow control lines or the XOff character) and the PC waits unlimited time. When the the machine ready to receive a next portion of data then the machine sends Xon or enable hardware flow control and the DNCP send a next portion of data. Receiving timeout (s) - Use this field to specify the time interval for the DNC to return to the normal working mode if no data received at all. File begin sign timeout (s) - After this interval the DNC will return to the normal working mode if no the program begin sign (usually %) is received. This interval is being measured since any bytes is received from a CNC machine. File end sign timeout (s) - After this interval the DNC will return to the normal working mode if no the program end sign (usually %) is received. This interval is being measured since the program begin sign is received.